Nigeria Police say Kassim Afegbua lawyer don tell dem say im go show for dia domot on Wednesday. Police talk -talk person, Jimoh Moshood tell BBC Pidgin say na Mr Afegbua lawyer call dem to announce say im dey come Force headquarters. BBC Pidgin try to reach Afegbua to confirm di tori but im number no dey go. Tori be say Mr Afegbua bin write press statement for former leader, Ibrahim Babangida wey e advise President Muhammadu Buhari make e no contest for di 2019 election. Di statement come get K-leg as anoda statement come comot say im no talk am. But later e come tell Thisday tori people say im talk am true-true. Di Police come enter di mata say wetin Mr Afegbua write na lie and e fit create palava for di country. Na so di Inspector General of police, Ibrahim Idris order say make dem arrest Mr Afegbua sharp-sharp. 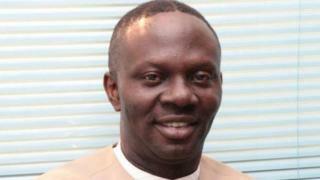 Some human rights activists don condemn di way police wan arrest Kassim Afegbua. Auwal Musa Rafsanjani say people get right to talk their mind and that wetin Afegbua talk no dey criminal. E say dis thing wey di police dey do dey downgrade dis government. E come add say police dey try close people mouth make dem no talk dia mind on top wetin dey happen. Chido Onumah talk say police no do well at all to order arrest because e write press statement for person wey im di work for. If police want to question am, why dem no go look for am for im house, why dem make am public? Why police no arrest or question Obasanjo wen im bin write letter to president Buhari? 'Dis no be di kind democratic order we bin dey look for', im add. Im come reason am say police no suppose dey show say dem di work for di ruling party wey be APC but rather for all Nigerians since dia job na to protect every life.